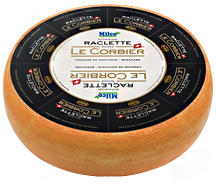 Le Corbier, raclette made of “mountain milk”, ripened for 4 to 5 months. As far back as the Middle Ages, the herdsmen came together to enjoy a savory raclette to reenergize and fraternize. To do so, they place a half-wheel in front of the stove and scraped the melted cheese into a plate. Over centuries and through generations, the know-how and gastronomy surrounding the fabrication of this unique cheese have perpetuated and become more refined. 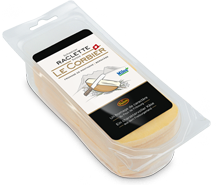 Today, raclette is part of our culinary heritage and is synonymous with tradition and convivial gastronomy. 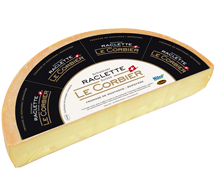 Our raclette, le Corbier, comes from milk originating exclusively in the mountain region and is ripened with care over 4 to 5 months. This increased ripening period gives it a different aroma. 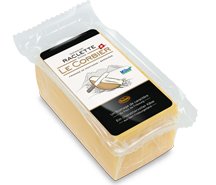 Le Corbier exists in Plain, Mustard Seed and bacon bits varieties. 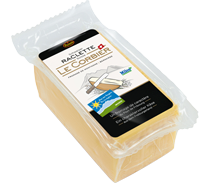 Le Corbier Plain is also available in a version that is certified 100% organic.